i'm in the process of building/cleaning/painting a studio/darkroom in a room in my house that when last occupied some twenty years ago housed the operating chair of my grandfather's dental office (creepy, right?). i really wish i had thought to take 'before' pictures of the space because i don't think i can accurately describe the piles of crap and dust i had to fight through just to get into the room. but at long last the space is entirely empty (save for the ikea bookcase i just erected), and is waiting patiently to be painted, or rather i am waiting patiently to paint it and trying not to just call it quits and move my crap in immediately since i still haven't unpacked any of my photo and darkroom stuff since i moved home from school last june. what a relief it will be to finally have my things organized again. the wait is almost over; i can taste it. i plan to use the room for a variety of art and photography work, so i've been shopping around for a work table that can accomodate my dual needs, which explains how i came across this amazing behemoth work table (pictured above) at pottery barn. the table neither fits inside the room nor into my budget (i'm not even going to bother posting the price) but i'm in love with it's sensible organization, matter-of-fact height, and large working space. i also really want the magnetic calendar pictured on the right hand side of the image. 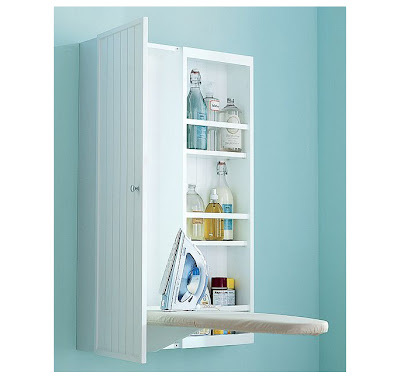 and just for fun, i threw in a picture (below) of this ironing cupboard for no real reason other than that the very of idea of it makes so much sense to me that i think everyone should have one, although at $279, it too, is kind of out of my price range. I've been on a quest for a project table too. Had my eye on the same PB table. They have a similar one at Pier 1 for $449. I think much less than PB. 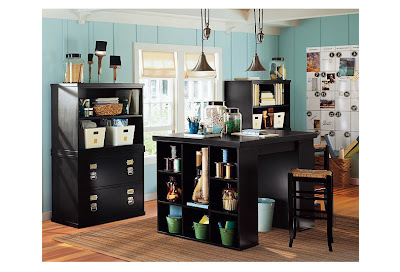 On Pier 1's site it's under Home Office furniture.